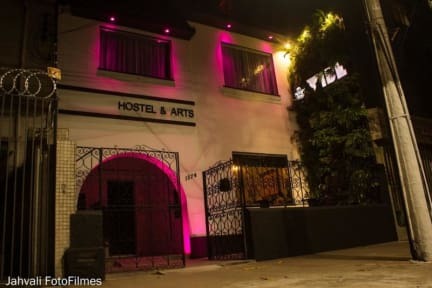 Ovibe Hostel & Arts allow guests a greater experience, more than just any simple hostel. We believe we can keep a balance between mind and soul through art, sports, music and food. Here, our guests can enjoy our art gallery featuring local artists exhibition, watch live shows on the weekends, try your hand at instrument lessons in our private music studio, workshops and finishing it all of with our delicious drinks made with regional ingredients and our taste burgers and snacks. Near our city we have marvellous beaches, you may even get the chance to catch a few waves and enjoy the cool sweet water, as well as other beach activities. We are located in downtown area, close to Nazare Avenue, a famous street in Belém where happens the Cirio de Nazare, one of the world’s largest celebrations honouring the Virgin Mary, who, as the Virgin of Nazaré, is the patron saint of Para. The festival occurs on the second Sunday of October, when the city welcomes more than one million pilgrims who come to participate in a procession that follows an image of the Virgin of Nazaré throughout Belém. Our hostel is able to accommodate 23 guests between the 3 rooms. we have 1 male community room that can hols 10 guests and 1 female room that can hold 10 guests as well. We also offer a private room that has room for 3 guests. Our hostel was built round 100 years ago and is made up of original Portuguese architecture. The property has a mix of rustic and modern style. We are closed on monday.Please, let us know your check in and check out time. Breakfast not included - 15.00 BRL per person per day.